I love the look of shellacked cork grips almost as much as the look of shellacked cotton tape. They are comfortable, shock absorbing, made of a natural material, inexpensive, and they look great. Shellacking grips is an easy afternoon project. Here's how to do it. First get some VO cork grips. You'll also need a small can of amber shellac from the local paint store. While at the paint store, also pick up a disposable brush, but get the biodgradable wood type, not plastic. Shellac is a resin secreted by the female lac bug, on trees in the forests of India and Thailand. It's made into flakes that are mixed with alcohol to make a varnish-like coating. You can buy flakes and mix them yourself, but for this little project I wouldn't bother. Make a little stand for the grips by sticking a couple of pencils into a cardboard box. Slide the grips over the pencils and brush on a thin coat of shellac. 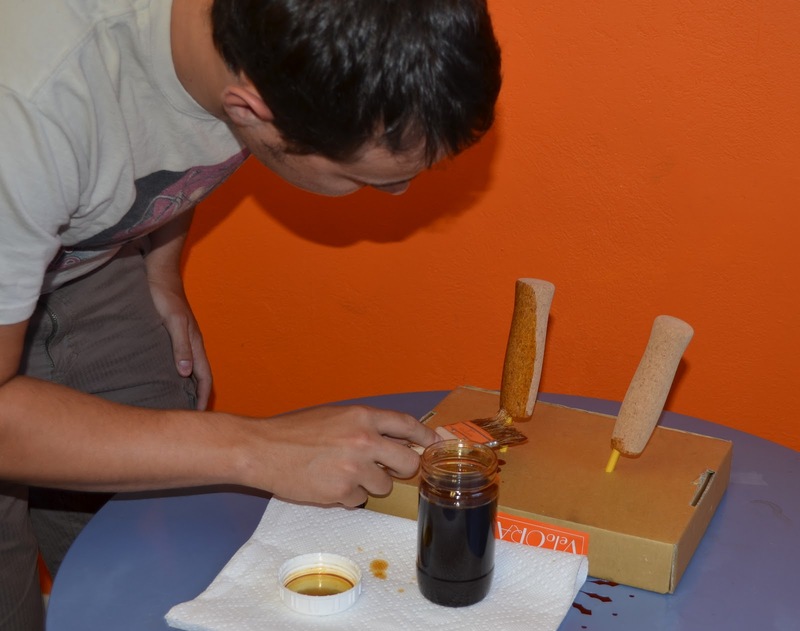 Allow to dry for an hour or so, or until no longer tacky, then brush on a second coat. I like about 4 coats total; putting on more will add gloss, but it will also make the grips a little slippery. In between coats put the brush in an airtight ziplock bag to keep it from drying out. 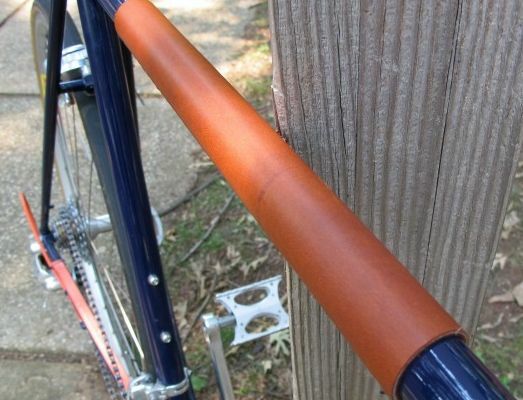 When the last coat dries, slip the grips over your bars. Remember that cork grips fit 22.2mm bars, not 23.8mm. Usually cork grips fit too loosely for my taste, so I put a strip of tape over the bar first; it could be duct tape, handlebar tape - anything that takes up space. 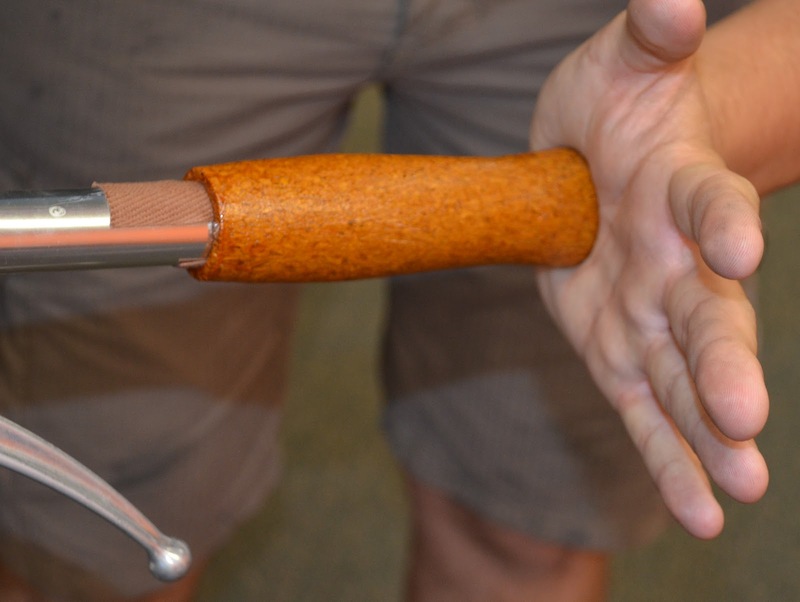 Push the grips on gently as it's easy to tear them. That's all there is to it--go for a ride. 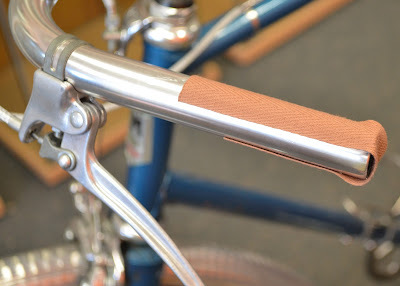 We also have those top tube protectors I wrote about recently. We're making them in a new type of leather called oil tan. It's made for chaps and meant to take a lot of abuse. They look really looks nice. 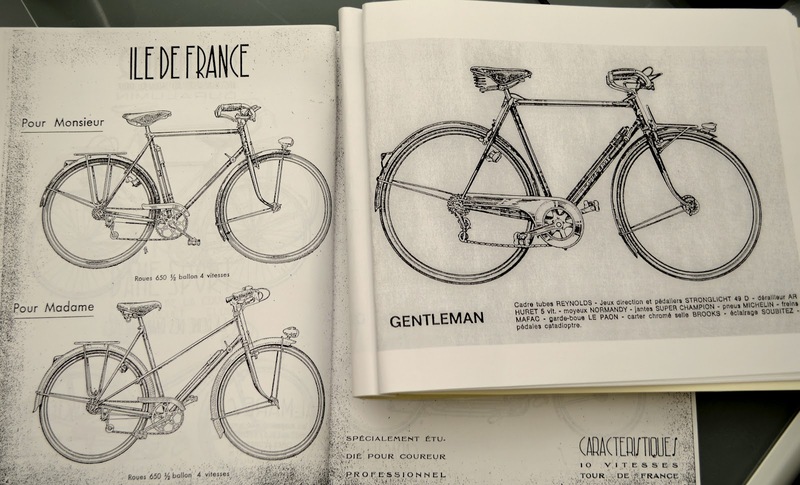 One of the standard models in most constructeurs' catalogs was an elegant city bike, a "gentleman's bike." 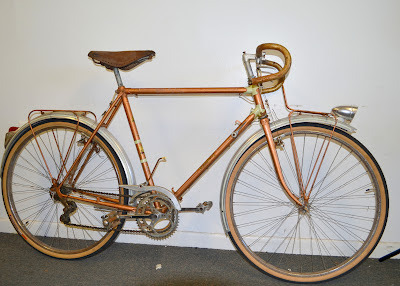 There was usually a similar ladies bike on a mixte frame. These were comfortable city bikes meant to be ridden around town and to work, even when dressed in business attire. The photo below is of old Alex Singer and Herse catalogs. We just finished building such a bike around a VO 60cm Polyvalent frame. I rode it home and a round town yesterday and thought I'd share some impressions. It's my second Gentleman's bike; the first was a custom by Ahren Rogers. But I've been riding a sportier singe speed/fixed city bike the past few years. The Polyvalent frame handles beautifully and I find it easy to ride no-handed or to dive into turns. There is really little to say about it because it simply does what is asked with no drama or compromise. That's the thing about this style of bike; it simply gets where you want to go in a comfortable and relaxed manner. And much of that is due to low-trail geometry. 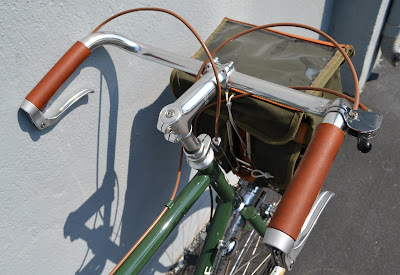 The handlebars are VO Montmartre bars. I really like their narrow width for slipping through traffic, and the rise allows one to sit upright. I have to admit that it takes a while to get use to the regal upright position, but once accustomed to it it's easier to look around. You really do see more. Some might wonder if 42cm wide bars fit me, being 6'3" tall with very wide shoulders. This was the standard bar width on bikes for most of the last century. They feel perfectly natural (we do have the similar Left Bank bars for those who want more width.) I think the trend toward wider bars has more to do with poor bike geometry than fit. Notice how wide the bars are on cruiser style bike and beach bikes. The wide sprung Model 8 saddle provides decadent sprung luxury. I purposely sped over Annapolis' brick-paved and cobble streets just to enjoy the shock absorption. The 38mm 650b Pari-Moto tires are very comfortable. I prefer them to the the Hetres I had on a previous city bike as they are, in my experience, less flat prone. But I'll probably switch to Panaracers Col de Le Vie tires which are even more rugged and have a deeper tread pattern. Some will argue endlessly over exactly which 650b tires are most comfortable, but given a 650b tires' large air volume and cushy ride I find it a rather ridiculous discussion. Is your bum really so sensitive? I'll also ignore small differences in rolling resistance; this is a city bike after all and the time spent fixing one extra flat will negate any advantage in rolling resistance. Give me a reasonably comfortable and flat resistant 650b tire with enough tread for the occasional unpaved park path or snowy day and I'll be happy. The three-speed Sturmey Archer hub is perfect for this style of bike, particularly so in a city like Annapolis with only modest hills. The gearing is low enough to avoid unseemly perspiration, yet there is the option to shift up on the downhills. 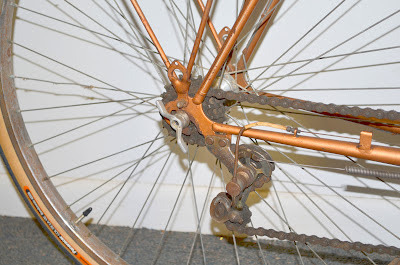 My previous gentleman's bike had a 1x6 drive train which might be better for hillier towns at the cost of a little more maintenance. Indeed, a 1x5 drivetrain is what most constructeurs used. I'm trying the White Industries Urban Platform pedals, which are a nice copy of the French Lyotard M23 'Marcel Berthet' pedals. They work well with VO half clips, leathered of course. The crank is a Grand Cru as is the chainguard. The bell is in the wrong spot for a bike ridden in an upright position; I'll move it to the handlebar. 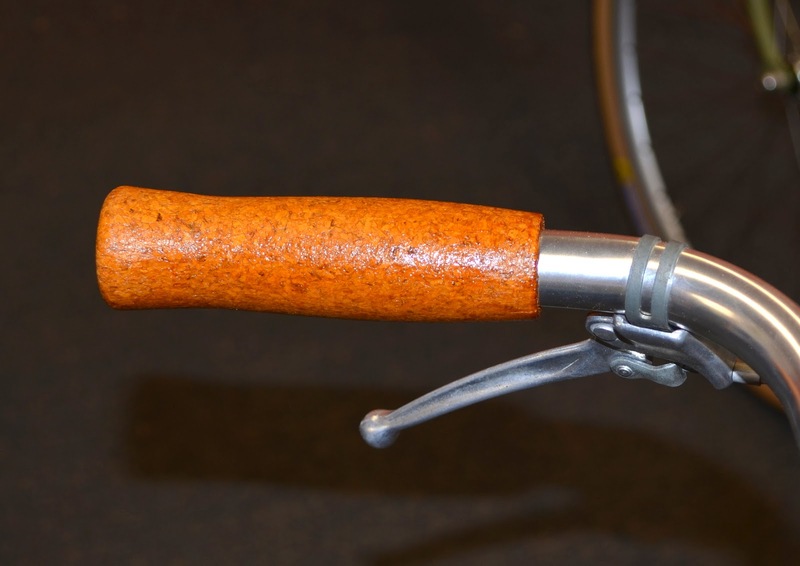 The leather bar grips are of a new thick oil-tanned leather we're trying. The front rack has an integrated decaleur which I now find almost essential on all my bikes. My old ALPS handlebar bag is perfect for my laptop, as well as a few groceries and a bottle of wine picked up on the way home. I said it couldn't be done, but I was wrong. 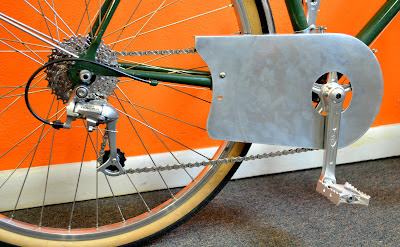 Casey managed to get a Porteur chain case to work with a rear derailleur and a 9-speed cassette. The clearances are tight, but it works perfectly. (Of course it won't work with a front derailleur.) The crank is a Grand Cru 110bcd fluted double, but with only one ring. 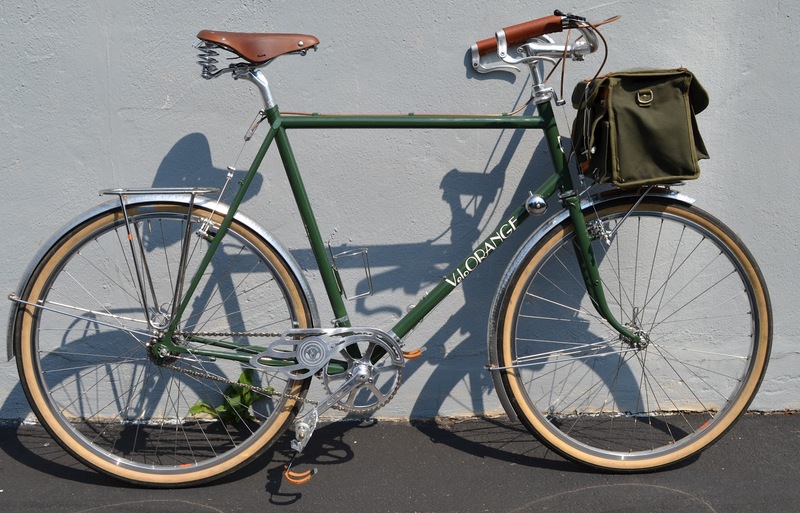 A fair number of the original porteur bikes had 1X5 drive trains, so this modernized 1X9 is in keeping with tradition. 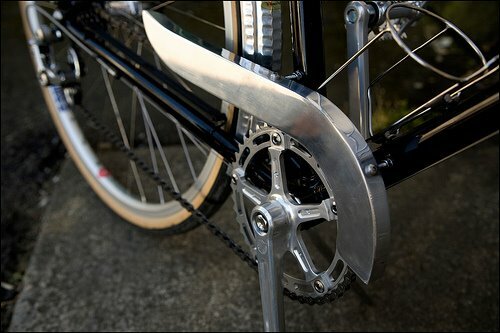 Speaking of single cranks, do you think we should get a single speed version of the 110bcd Grand Cru? It has more clearance that the 50.4bcd so is much easier to set up. And if so, what is the ideal chain ring size? I'm thinking 46t. Some folks feel that the logo on the Grand Cru chainguard, in the previous post, is too big. Let me explain why I did it that way, even though I generally dislike oversize logos. The large logo on this chainguard follows a certain style of chainguard that I happen to love. Many companies made guards with their logos as part of the design. It was considered cool, even fashionable. My all time favorite is the CLB guard. Here is the new Grand Cru Plume Alaire chainguard. Back in the day there were dozens of companies making elegant chainguards in dozens of patterns. They kept one's trouser cuffs presentable and added a bit of style to even the most pedestrian city bike. Have a look at this post, called Chainguards as Art. 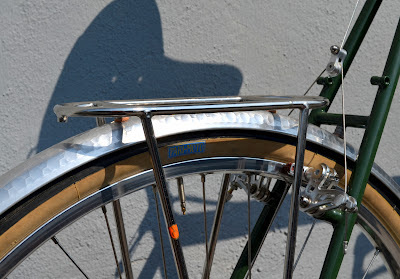 You might notice I wrote, in 2007, that VO should start working on an elegant chain guard. These things take time. Actually we already have the Porteur Chaincase and VO Alloy Chainguard. We also made this prototype simple chain guard that may return next year. We should have them in stock by late summer. Here are a few updates on various topics. We received an air shipment today, mostly re-stocking stuff that's been selling faster than expected. 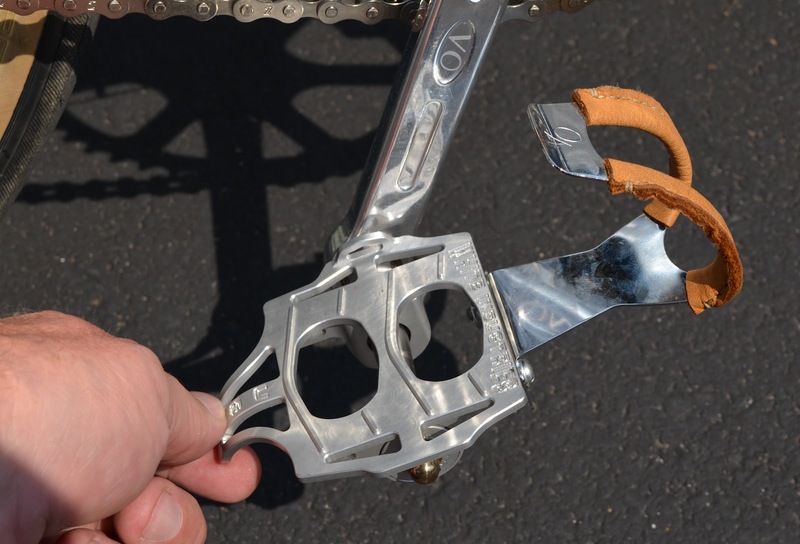 VO touring pedals are the one item we were completely out of that came in. Every few months we review inventory for products that are overstocked. I put a few of these on the specials page. It's worth a visit. We've been out of wheels for too long. 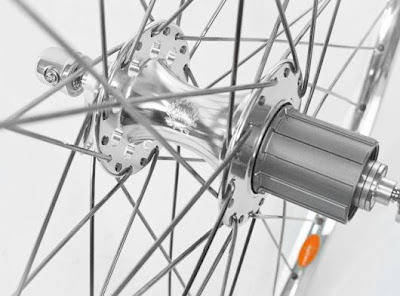 Our wheel builders are almost finished and they should arrive late next week. That's the good news; the bad news is that we are still out of Raid rims and wheels. How do you guys like the soft cloth bag packaging we're using for hubs, saddles, and other components? The bags cost more than boxes, but they're reusable. (I use several to organize stuff when traveling.) We also save a little on shipping using bags since they take up less space. We're considering using them for more products. Cirque du Cyclisme happens this weekend. Lots of cool bikes and a very nice swap meet. 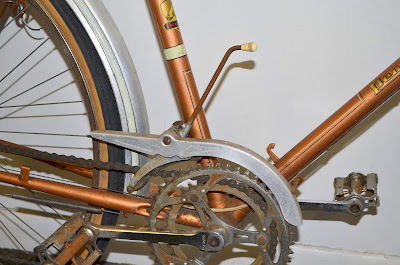 Some fascinating bikes visit our little showroom. 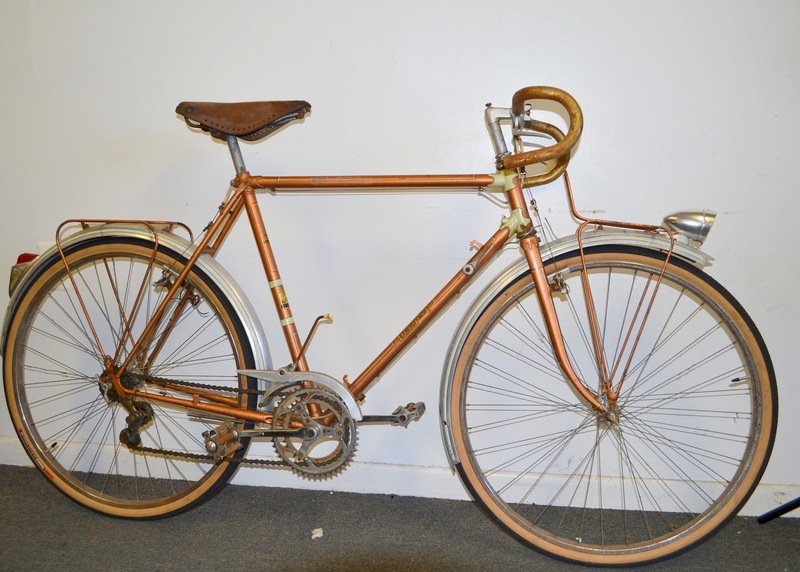 One of our customers just found this Peugeot bike on Craig's List and brought it by yesterday; she needed some new 650b rims. It's a late '50s PX50, probably 1959 (from the serial number). I wrote about this model in 2006, which I called "A Randoneusse for the Common Jacques". Even in the glory days of French cycling, not everyone could afford a Singer or a Herse. So what was the French lunch-box-kind-of-guy to do when he wanted a randonneusse. 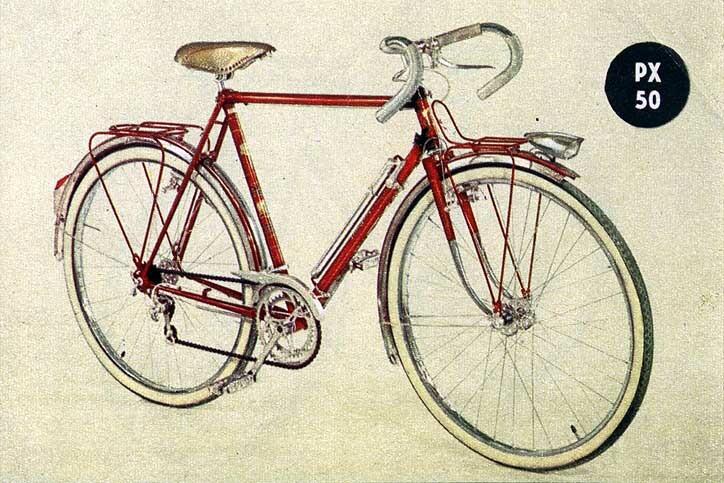 One option was to get a Peugeot PX50, a production randonneur bike... It's just the thing for a rough French country road. 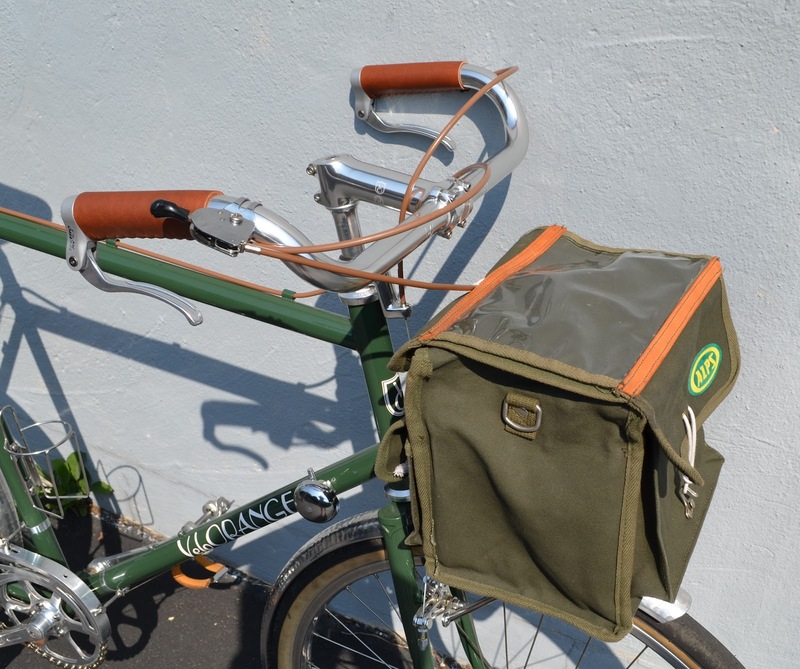 The front rack is perfect for a handlebar bag and the rear would take small panniers. Also note the Cibie lighting system and the cool brake levers. I see that the first catalog to list this model is the 1953 edition. It seems to have disappeared sometime between 1963 and 1969. Apparently not many made it to North America, but they were sold in Japan. 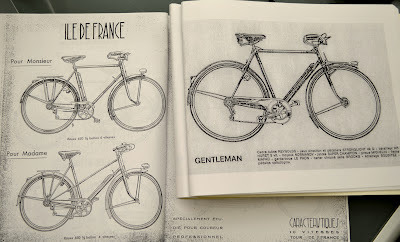 The photo [below] and information is taken from Cycles Retro Peugeot , a wonderful collection of Peugeot catalogs from 1929 to 1989. Here a brochure photo of a similar model. Note the Mafac cantis, guidonet levers, and lever-shift front derailleur. The new owner is very knowledgeable and I'm sure she'll have her new PX50 in fine shape and on the road soon.